Hi there! 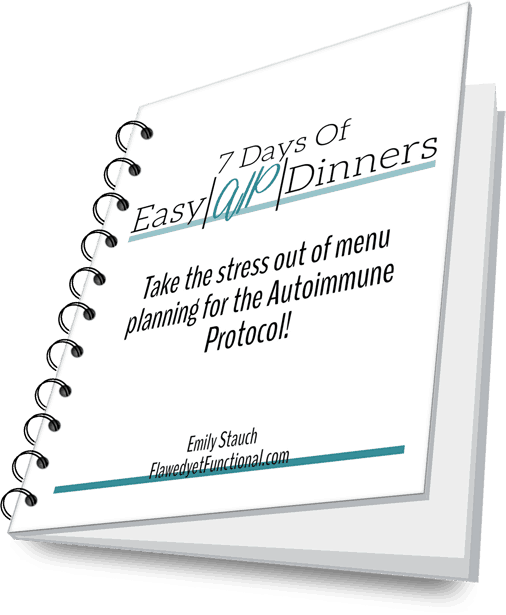 Since I am using the Autoimmune Protocol to control my blood sugar, grains and eggs are not in my diet right now. You know what that means? Breakfast takes time! We eat hot breakfast every day: vegetables and meat mostly. Bacon is in a regular rotation, but it is the one meat I am most likely to burn because I have so much going on in the morning. Are you ready for your mind to be blown? There is an easier way to make your bacon (and cleaner!) than the stove-top! It’s so simple: bake it in the oven. The whole family loves bacon, so I make it once or twice a week. I grew tired of the mess it made on the stove and the babysitting it required. Paying close attention is not my strength…I’d burn it more often than not. So I decided to give baking bacon a try. After my first time, I was sold, and you will be too. Let me show you how easy it is. This might seem backwards to you, but don’t pre-heat the oven before tossing the bacon it. If you do, not all is lost but the bacon will cook too quickly resulting in more crisp with less chew. It really is easier because you don’t have to wait for the oven to pre-heat, just prep the pans and toss it into a cold oven THEN turn it on! Line a rimmed baking sheet with parchment paper. The parchment paper will catch all the bacon fat and crustiness that develops as the bacon cooks making for easy clean-up AND easy pouring of bacon fat into your fat can. You don’t have a fat can where you collect bacon fat for later use? Oh. You should. Roasting vegetables with bacon fat instead of olive oil or coconut oil is AMAZING. In fact, that is my twist on these carrot fries. Using real bacon is time-consuming and expensive, but using old bacon fat in place of the oil is fast, inexpensive, and delicious! To the best of your ability, don’t allow the bacon to overlap. Any place the bacon is on top of another piece will stick together and not be crispy. The bacon I use comes in 12 ounce packages. I can fit all but the last piece nicely on one pan. With a little squeezing, I make that last piece fit, but it usually overlaps or touches a piece or two. 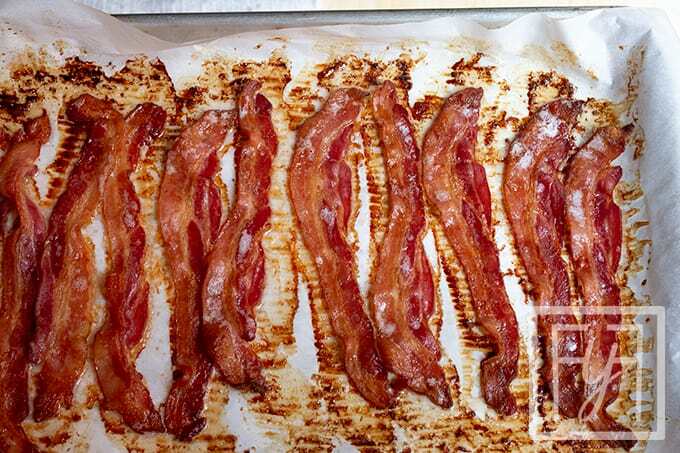 Toss those beautifully laid out sheet(s) of bacon in the oven and cook until your desired level of crispiness. It is really difficult to pinpoint a baking time. Begin checking the pan(s) at 20 minutes then every 5 until you like the crunch level. For our breakfasts, I bake two pans of bacon. My kids like “floppy” bacon (gag! ), and the parents like crispy. I take advantage of the uneven temperatures in my oven with this dish. The bottom pan cooks faster and crispier while the top is slower and floppier. They both end up done about the same time with two VERY different levels of crispiness. Score! Less shrinkage – The bacon will be wider and longer than when cooked on the stove-top. More chew – The texture of the bacon will have more bite and chew to it, much like restaurant bacon. Melty, delicious fat – The fat of the bacon is more melt-in-your-mouth. Serve that perfect bacon up with some “oatmeal,” pancakes, or pan-fried cinnamon sweet potatoes, and you’ve got one delicious breakfast! Baked bacon is so simple that I can’t believe it took me so long to try it. Truly, it is the easy, cleanest way to make bacon, not to mention the tastiest. Try it today! 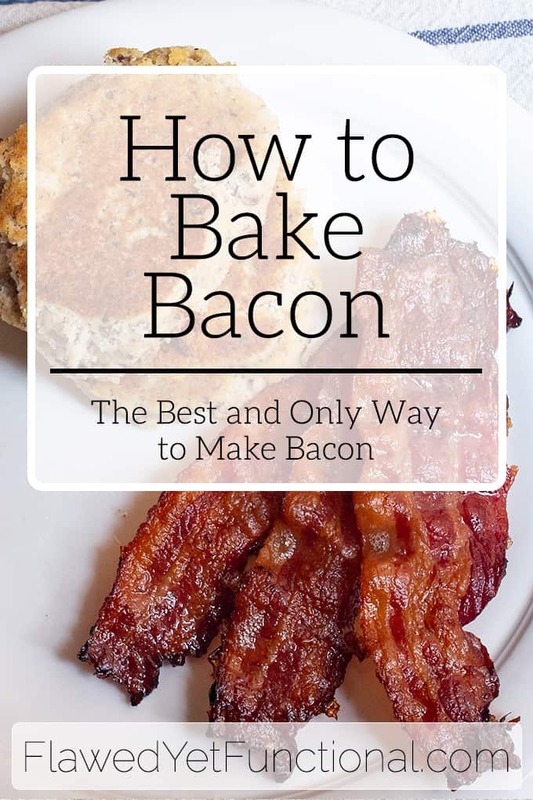 Baking your morning bacon is the simplest and best way to prepare bacon. The texture is chewy. The fat is melty, and there is WAY less shrinkage. Did I mention clean-up is a breeze? Try it and you'll be a believer too! Line rimmed baking with parchment paper. 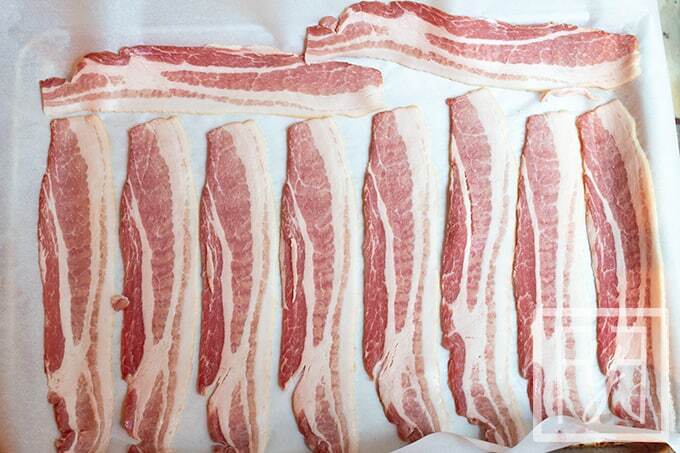 Arrange bacon in rows so each strip is not overlapping another. Put into COLD oven then turn oven on to 400°. Bake for 20-30 minutes or until desired level of crispiness. Begin checking bacon at 20 minutes then adjust cooking time.